How do I get my Troop involved in Orienteering? As you read through these pages you will see that Orienteering is not the simple pace and compass game done completely with a compass that was introduced to Scouting years ago. It is not a c omplex sport, but does require some technical skills in navigation for the participant and in mapmaking for the organizer. For this reason it is probably best to work with an organized Orienteering club for your first experience. If there is a local Orienteering club in your area contact them to get their schedule of events. 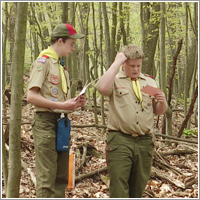 A troop can usually attend a regular local event to get some Orienteering experience. Most clubs have their schedules planned a year in advance so your group will have plenty of time to arrange their schedules. Get the Scouts ready before the event. Spend a meeting or two going over map symbols. Note the symbols for Orienteering maps are not the same as those for USGS maps listed in the Handbook. The maps usually have a legend on them, so the Scouts will have a reference in the woods. Do the meeting room game to familiarize them with orienting a map and using it to find something. Show them how to orient a map using the features on the map so they can orienteer without a compass if necessary. Set up an outdoor pace course so they can start to estimate distances. Remember Orienteering maps are metric, so they need to estimate in meters. You can use 110 yards to equal 100 meters, or in other words one football field plus an end zone. Orienteering maps are oriented to magnetic north, so don't worry about declination for this activity. You might find an orienteering event planned for scout groups in your area. Here the courses should be designed at the proper level of difficulty for scouts. These are usually cooperative ventures between an Orienteering club and a District or Council. If you don't have a special event being planned in your area get to work on one. Most clubs will be glad to help out, especially if you choose a location that they have already mapped to orienteering standards. Map production often takes over a year from initial planning to finished product, so plan to use an area covered by an existing Orienteering map or plan well in advance. Some groups may choose, or because of geographic location be forced, to organize their own event. A suitable area must be selected and a map produced. Scout camps are usually good places to start because they are easily accessible to all troops and many people can benefit from the work that will be required to complete the map. The best maps are offset printed in 5 colors, but computer generated prints are becoming more adequate as the technology develops. If the organizers have someone that is interested in producing a color map of the area to be used, there are a couple of CAD programs available. The most commonly used program among orienteers is OCAD. A good color map will involve several steps. The cost for all this will exceed $500/ square Kilometer. Two square kilometers is often enough for an event, depending on the complexity of the terrain, but more area may be needed in areas with few mappable features. Most groups choose to start with a black and white map which can be done very cheaply.